One of my favorite super-simple projects has come back around, this time in Country Living magazine. It’s paper hardware, crafted from actual photographed hardware. 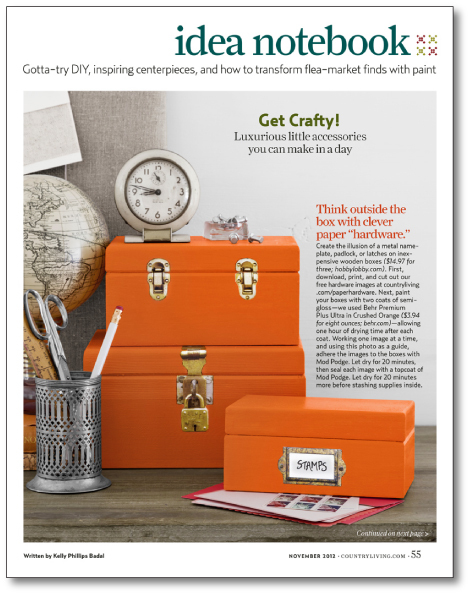 You can find full instructions on my previous post, or in the November 2012 issue of Country Living (and on the CL website any day now with free paper hardware download,) for adding them to painted wooden boxes. 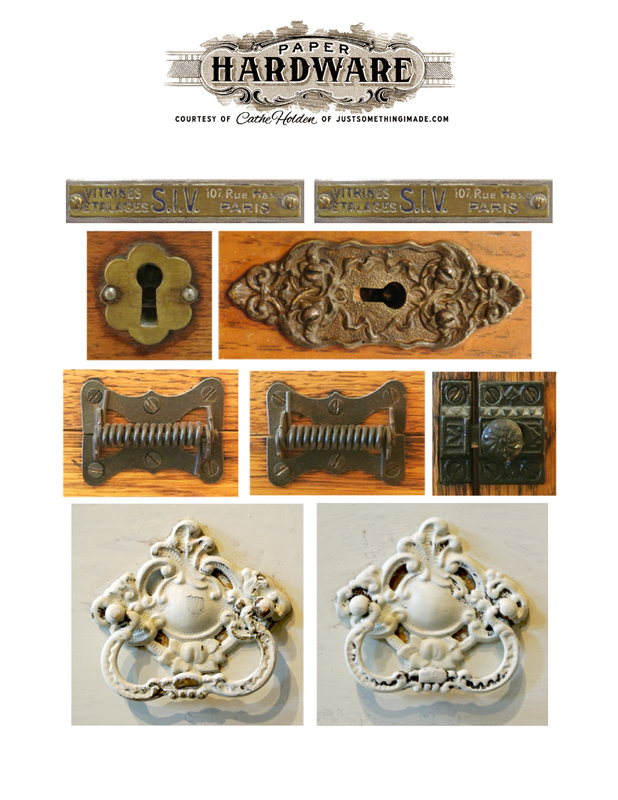 Special thanks to Ray of Ray’s Trading in Sebastopol, CA for resourcing the perfect padlock hardware for the Country Living project! 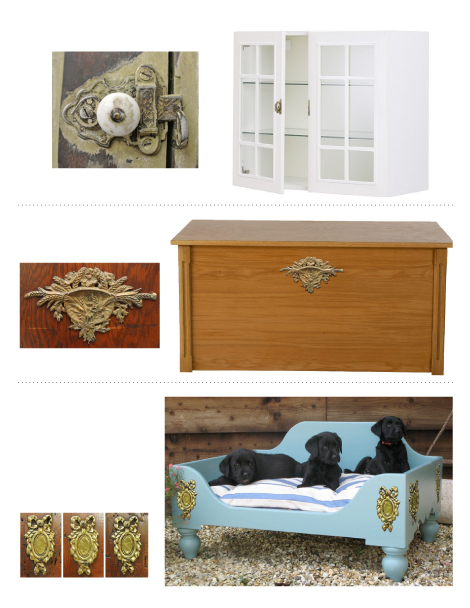 You can add paper hardware to virtually anything, but it would be super fun to add to furniture pieces. 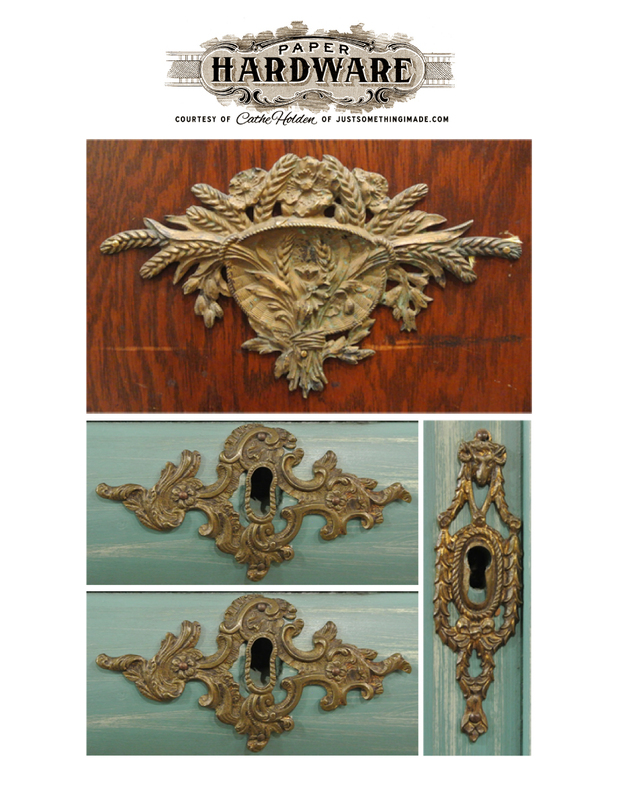 Check out this beautiful distressed piece I found at Sienna Antiques in Petaluma- gorgeous color inspiration with brass pulls and escutcheons (aka: key holes) that are perfect for dolling up a more moderately priced tallboy. 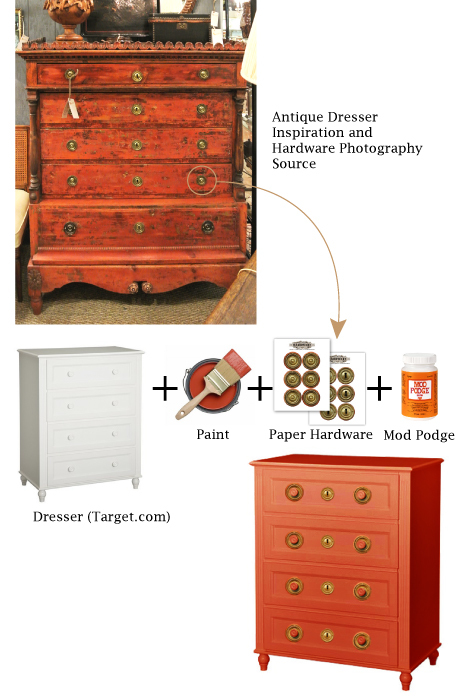 And here are more examples (created digitally for inspiration) using hardware I photographed at Sienna and other local antique stores. If creating your own hardware image files, always be sure you get the shopkeeper’s permission before snapping images of their goods. And remember, you probably have some cool hardware on a few of your own pieces! 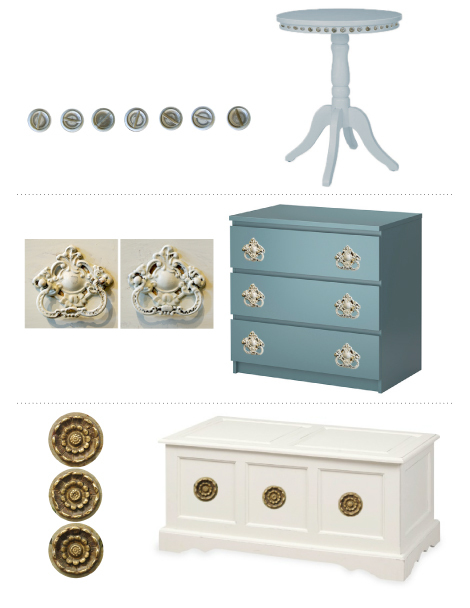 Here are a load of free printables to get you started on your own paper hardware projects! Click on an image for a larger file to download and print-to-fit letter-size paper (or full sheet label stock) or size to best fit your project. Trim out hardware, use a neutral color marker around the edges of the trimmed piece to erase the white edge of the paper, and add to furniture, journals, collages, boxes…anything! Feel free to use these also in your digital projects. This entry was posted in Country Living Magazine, CountryLiving.com, Free digital collage sheets, Free digital downloads, Free Jpgs, Paper Crafts and tagged Country Living, Mod Podge, paper hardware. Bookmark the permalink. 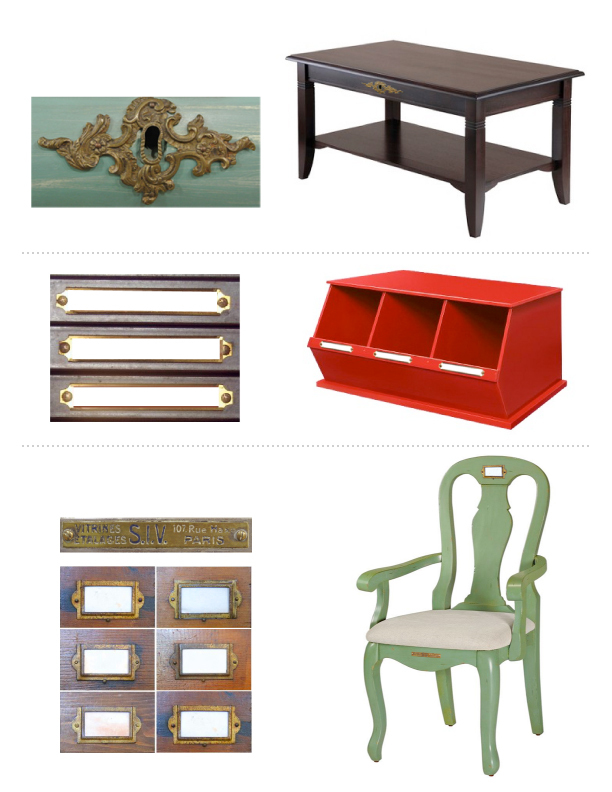 These are great ways to add some vintage charm on the cheap! Thanks for sharing them with us, Cathe. Love the hardware! 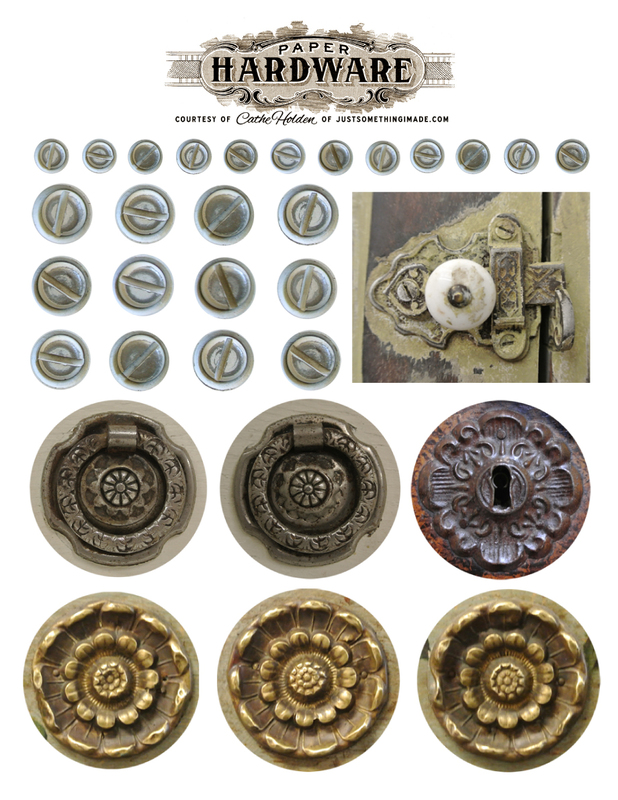 I especially like the key hole ones, easy to print and cut and glue. Thanks so much! Thank you Cathe! These are wonderful! Thank you Cathe! I love these. What a wonderful idea and great pics for older hardware. I own a few antiques and some need hardware. I inherited several “family” pieces from my mom and some are missing hardware. Great pics and they print out beautifully!! Great idea Cathe. 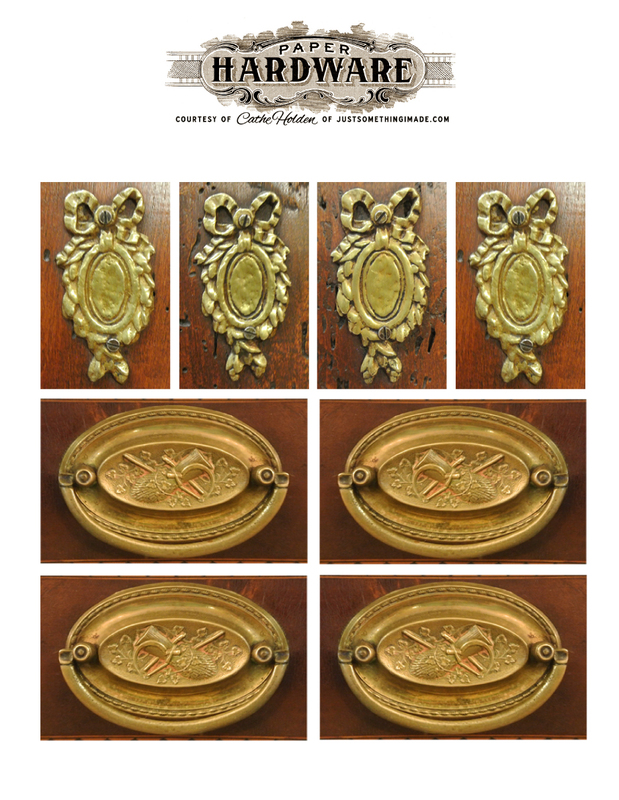 Thanks for the downloads.hugs Mrs A.
I love all of these hardware for furniture & crafts. I did copy the sheet that you used on the paper boxes. Will try to copy the others later (the ones you got from furniture). They are beautiful. 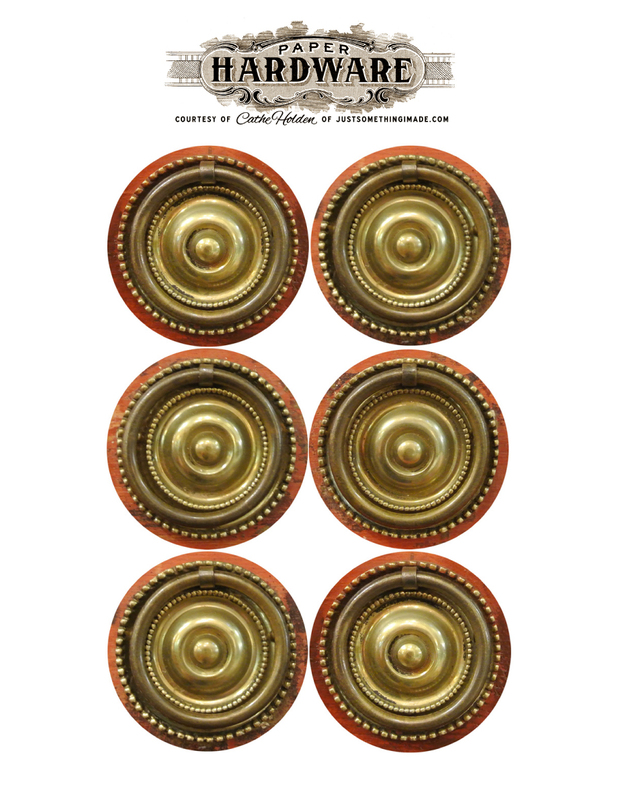 I would love to find some actual ” Old Thumbtacks to do a stool with” You know the kind with raised and shaped heads. wow, so pleased to find your site and FB page….so many ideas, so little time….can’t wait to start some…..thanks….have a wonderful weekend..
Just stumbled on your blog, and I love it. 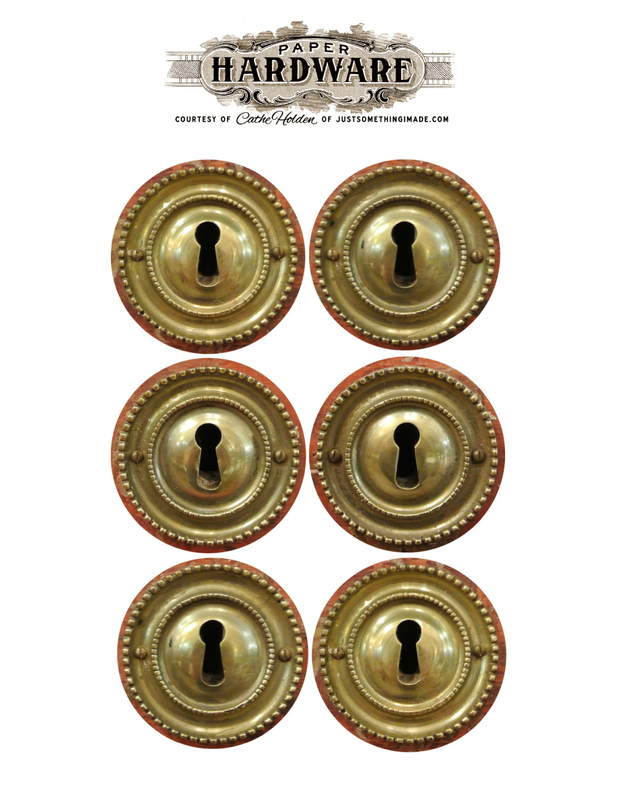 Wouldn’t the keyhole ones look cool on the front of a journal? You always have such wonderful things to share with us for download! And so many creative ideas I can’t even keep up! Thank you! Thank you for all your wonderful articles and ideas! Fun assortment of hardware. Something different. Thanks for sharing. Just caught your site on pinterest … really original idea. Great Stuff ! I love this idea! Thank you! Now I have something new to decorate my notebooks with. 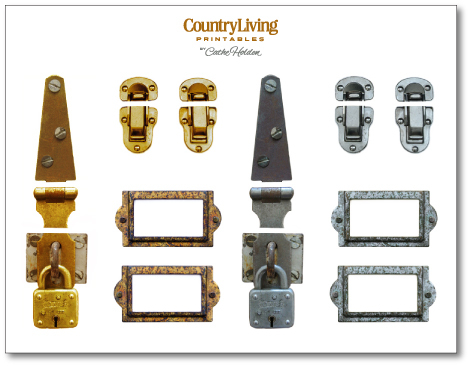 On another note, the free paper hardware download from CL does not seem to work – Maybe they took it down?